… no not my waistline. To be exact, we’ve expanded our head office and taken on additional staff! The last few months have been extremely busy and our export sales in particular have been very strong. In addition, we launched our hire division, introduced an ‘offshore’ arm, and taken on several major distributors, which have all added to the increased demand (whilst still keeping our speedy service!). As a result, we’ve doubled our head office space and have recently added two members of staff, under a government-backed apprentice scheme. Jess Hill and Josh Young are our Business and Engineering Apprentices, respectively. I would like to welcome them to the growing Straightpoint team and I’m sure you’ll be speaking to them soon! 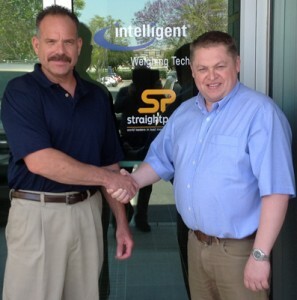 Straightpoint, Inc are pleased to announce the appointment of John Molidor as a technical sales engineer. David Ayling, director, said “John has a wealth of experience in technical sales, customer support and engineering roles and his broad experience will be invaluable as Straightpoint, Inc increase their North American market presence”. As part of the Straightpoint global ‘roadshow’(! ), I’ve visited a couple of our distributors recently – Rigmarine in Azerbaijan (who also represent Kazakstan) and Wolfgang from Pfeifer in Germany, showing them our new catalogue, products and desktop controller software. If you have a business proposition and would like me to visit you, please do get in touch. 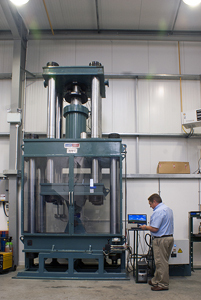 Previously, we employed two reference load cells for use with our 350 tonne test and calibration machine, which we interchanged, dependent upon the size of the job. We’ve now invested in a brand new reference #loadcell which is suitable for all tests, up to 350 tonnes of compression and 350 tonnes of tension. The reference #loadcell has been calibrated by the National Physical Laboratory against a master load cell, which is stored in London so that the load is always traceable, accurate and reliable. We use the machine to test and calibrate all our products before being shipped to clients and distributors globally.